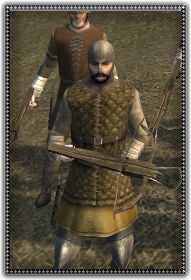 Hailing from the towns and cities of the Christian levant, these crossbowmen have some skill with their weapon. Though they have had practice since they were boys, did they ever dream they would use their crossbows against men? These men will be terrified from an approaching enemy and rout in a mêlée. Best used for defending city walls. Archers with poor crossbows, but familiar with their use. Poor morale.